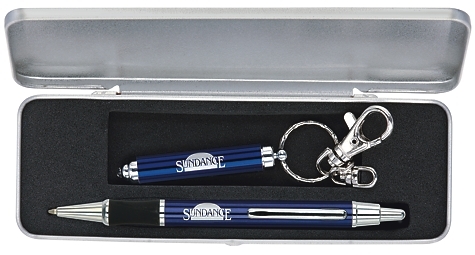 Bulk Personalized Pen & Flashlight Keychain Sets with White Light, in Silver Satin Tin Box. This is a deluxe pen and flashlight keychain gift set in beautiful translucent colors with silver trimmings. Refill: Jumbo medium point blue ink. Imprint: Laser engraving or one color imprint (max. 3/4" x 1") below clip or starting 1/4" away from clip (max. 1-3/4" x 1/2") beside clip and (max. 1" x 7/8") on flashlight key holder included. Please specify location. Long life battery included. Free artwork design . Budget Prices in the USA and Canada for executive-quality personalized pen and flashlight keychain sets. American clients pay no taxes. 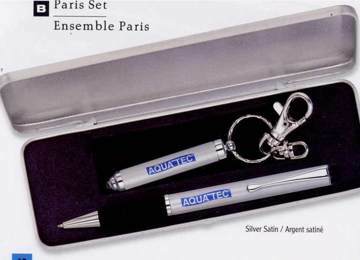 Prices include 1-color laser engraving or silkscreen imprint (your choice) on both the pen and the flashlight.